"I wanted to share with everyone who helps guide dogs on their journey just what it is like to be a guide dog owner. In the shopping centre its busy. Lots of noise,people walking in all directions. I have bits of vision so i see bits of arms feet bags faces. I feel someone beside me. Hear someone behind me. Im concentrating very hard to stay upright, to not walk into anybody and get to where I want to go. Im creeping slowly,carefully. Concentrate! I walk outside into the sunlight im completely blinded.. I step out into the sunlight,im blinded. I look down and can make out Rosie my gd. She is scanning. I tell her "left' and off we go. She strides confidently forward finding the way through the busy high street. People see her and part to let her through. I feel completely relaxed. Im enjoying the sun on my face and being out with my dog. People all around are looking at her,admiring her. I look down and she is looking side to side checking all around us is clear. My heart aches with love for her. She is like a Guiding Light. I just need to follow. I know that if there is not enough room for us she will stop. If there is a kerb or something on the path she will stop or lead me round it. To walk with her is a joy. 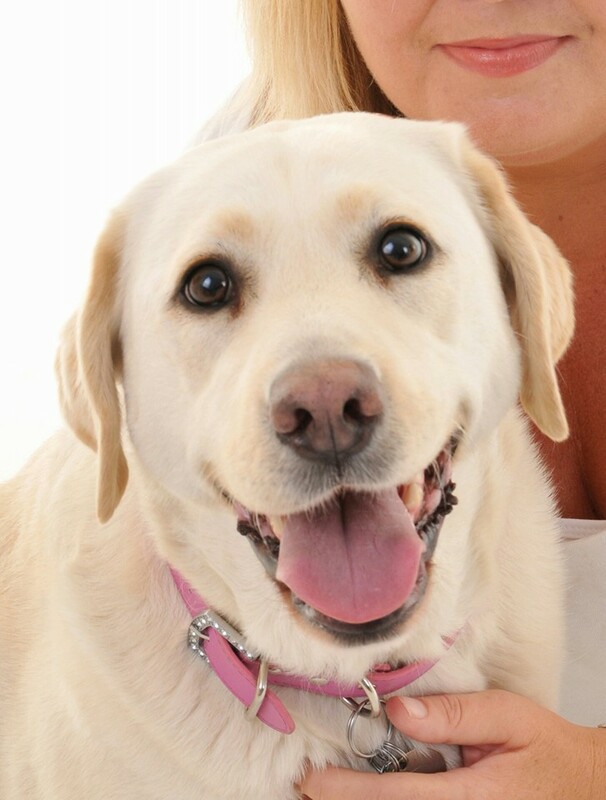 Picture shows light yellow lab gd Rosie smiling." Isn't Rosie gorgeous? What a smile! Us puppy walkers go through a lot of emotions through the year. Parting with the pup is total heartbreak. I tell Twiglet, as I did with Gypsy, every evening when I kiss her goodnight "You are not my dog, but you are going to have a very special owner to take care of and they will love you just like I do." But reading Helen's story and those of people like her makes it a journey I am happy and proud to take.